These little beauties were made in celebration of a dear friend & neighbour’s 80th birthday! Hope you had a lovely day David! David has many a tale to tell. Well after all, being 80 years young he’s seen a lot. He worked as a chef on board the merchant ships as a young man and later sailed on impressive liners, even meeting famous people like Winston Churchill and the Queen Mother! So when our neighbour passes praise for my pastry work, I know I’m doing something right! And, yes, David thoroughly enjoyed his birthday chocolate éclair. This is why I’d never been inclined to order one in a tea room or restaurant, never mind making them at home. Up until the other day I’d never made choux pastry, nor eaten it actually! 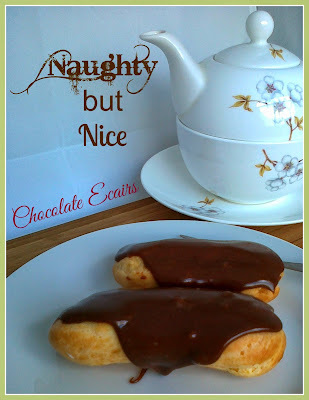 Yes, I’d NEVER eaten an éclair or profiterole! I know! Surprising! I just don’t care for cream. As a child, my maternal grandma would always make a trifle when we visited each weekend. Yummy yes, but for me it was only yummy when the cream was knocked off! So grandma, bless her heart, would make me my own individual trifle! With extra sponge in the bottom. That was, and still is, the best part of a trifle; when the jelly has soaked into the sponge! Mmm! So everybody else shared a large trifle whilst I had my very own, without the cream! So when David had said, a few months ago, about how much he enjoyed éclairs but had not had one for a long time, I made a mental note to myself that I would make him one for his birthday. I did some reading about the choux pastry, mainly following the guidance provided by James Martin. There does seem to be one or two key pointers to follow, which I shall cover in my page ‘A Guide to making….Pastry’. But it really wasn’t that tricky, just follow the pointers and you’ll be well on the way! As for the cream, well I made a Chantilly cream by adding some icing sugar and vanilla, which for me is far more palatable than straight cream. And knowing just how much David loves lemon, I also rippled some nice lemon curd through the cream. 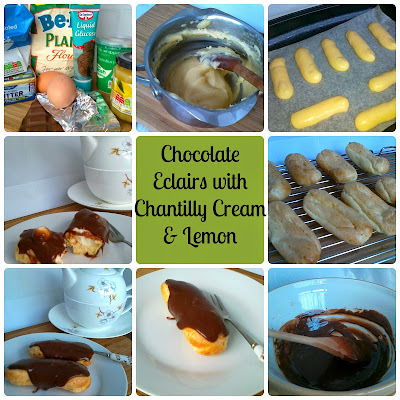 Regarding the chocolate, I would normally have been drawn to making a chocolate ganache for the éclair topping, but having watched James Martin make éclairs a few weeks back on the Saturday Kitchen, I was persuaded to try this version. A boiling sugar solution is added to the melted chocolate! Sounds totally wrong, I know, given how chocolate responds to excess heat, but with the addition of the liquid glucose, which prevents sugar crystals from forming, it works a treat. It produces a lovely shiny chocolate which firms beautifully without becoming excessively so. Cost:. about £3.65, that’s almost 46p each. 1. Preheat the oven to 200c / 190 Fan / Gas 6. Place a sided tray onto the oven’s bottom shelf. Prepare a baking tray for the éclairs with greaseproof paper by sticking each corner down with a dab of margarine. 2. Make the choux pastry Place the mixture into a piping bag, no nozzle required, and pipe ‘sausages’ onto the prepared baking tray about 6cm long, well spaced to allow for expansion as the pastry cooks. 4. 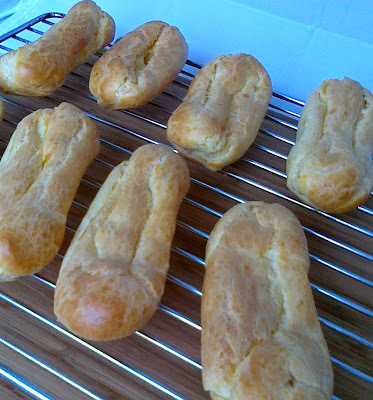 With a dampened finger, smooth the choux pastry paying particular attention to any raised parts. 5. Place in the oven and quickly add a cup of water to the tray which has been heating on the bottom shelf. Close the oven door promptly. This will create the steam. After 6 minutes of baking, open the oven door by 1-2 cm. This will remove any excess steam. Keep the oven door ajar, considering the safety of any children or pets. Bake for a further 10-15 minutes. You may need to rotate the éclair tray 2/3 of the way through the total bake. Once baked, turn the oven off, remove from the oven and, using a sharp paring knife (or similar), make two holes at the ends of the underside of the éclairs. This is where the cream will be piped in. Return the éclairs to the cooling oven, placing the incision uppermost. 6. Make the Chantilly cream. Pour the cream into a good sized bowl. Add the vanilla and icing sugar. With a balloon or egg whisk, whip until thick. Avoid over whipping. 7. In a small bowl, slacken the lemon curd with 2-3 tsp of water. Add to the cream and lightly mix until it is slightly rippled. Place the cream into a piping bag (no nozzle required) and stand it in a pint glass until required. 8. Once the oven has cooled remove the éclairs. Place on a cooling rack. 9. Make the chocolate sauce. Melt the broken chocolate over a bain marries. In another small pan, add the water and sugar and place over a medium heat. Allow the sugar to dissolve into the water. Add the liquid glucose and boil the liquid a little. Once the chocolate has melted, take the bowl off the pan and pour half of the water into the chocolate. Beat well. It may feel at first that the chocolate has seized up but continue mixing, adding more sugar solution (if required) to slacken the mixture a little more. Allow the chocolate mixture to cool for 5 or 10 minutes. 9. Fill the cooled éclair buns with the cream. Cut the end off the piping bag, leaving only a small opening for the cream to come through. With the éclair gently resting in the palm of your hand, insert the end of the piping bag into the hole you made in the éclair and fill the pastry with the cream mixture. Do the same with the second hole. Wipe off any excess cream from the éclair with a pallet knife, or similar. Repeat for the remaining éclairs. 10. Using a pallet knife, coat the incision side of the éclair with chocolate. Place on a cooling rack for the chocolate to firm up.